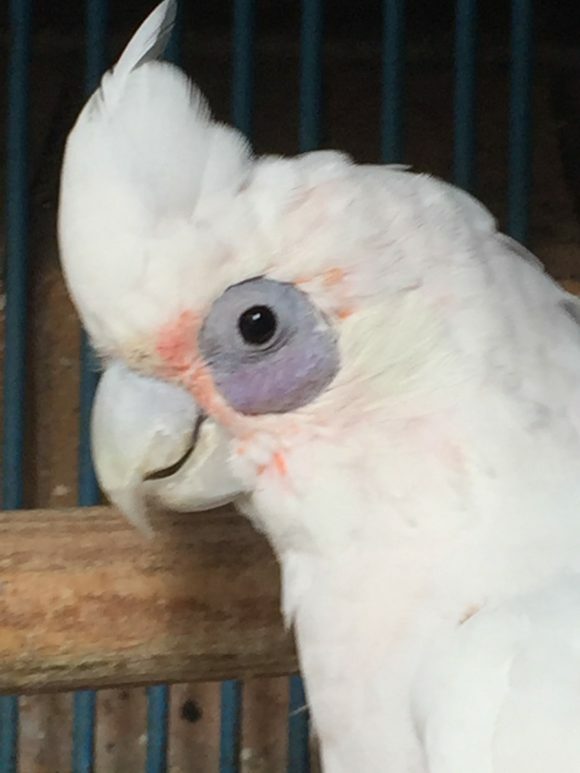 The picture above is one of my favourite bare eyed cockatoo – Casper. Well actually Casper is the only bare eyed cockatoo I know, and I have owned her for the last 14 years. When I bought Casper at the Pet Shop back in 2003 I was told she was male. She was a couple of months old at the time and said hello hello hello non-stop. She was very playful and being hand-reared was also already tame. She fitted into our home perfectly, but because I was the one that gave her the most attention, she latched on to me, making me her favourite. She stayed in our lounge and on our porch during the day along with our cockatiels for the next four years. When my daughter came along, she couldn’t resist sticking her fingers into the cage, so, unfortunately, I had to build an aviary on our porch for both Casper and our two cockatiels. I missed having them indoors, and Casper stopped saying hello, but is still very tame and says other things, most of which I can’t make out. Generally, I think my birds are happier outdoors. The cages are well protected and out of the wind, and they get to socialise with all the wild birds on a daily basis. They all get taken out for a while every day, and when I do bring them inside due to bad weather on the odd occasion, you can see they are itching to be outside again. Even our budgies enjoy being taken outdoors each day and make a hell of a noise until we move them outdoors. I only found out last year that my beloved bare eyed cockatoo was actually female when she got suddenly aggressive for a while and then produced three eggs. I felt sorry for her as I could see she was broody, but these birds now cost well over R10 000 in the pet shop and I just couldn’t afford another. What Is A Bare Eyed Cockatoo? Bare eyed cockatoos are also known as little corellas or short-billed corellas. Sometimes they are also confused with the smaller Goffin’s cockatoo. Bare Eyed Cockatoos are medium-sized white birds (14 to 17 inches long) with short white crests that mostly lie flat on their heads, blue eye rings with a blueish bulge below the eye and a small pink patch between the eyes and nares. The undersides of their flight feathers are yellow. These parrots go by the Latin name Cacatua sanguinea and are common and found in large flocks throughout much of northern and central Australia, where they inhabit riverine woodlands near grasslands and agricultural areas. They also invade cultivated areas and damage crops; during non-breeding season they may gather in huge flocks of 20,000 or more birds and spread widely through grasslands in search of food and are often killed as crop pests. In the wild, they feed in trees and on the ground, mostly on seeds, crops, fruits, berries, buds, flowers and nuts and insect larvae. They are most active in early morning and late afternoon. Bare eyed cockatoos are intelligent birds with exceptional personalities. They are gentle, playful and affectionate – and they make very good pets. They don’t often speak well, but they are not as loud, demanding or possessive as the larger white cockatoos. So does the Bare eyed cockatoo make a good pet? Although these parrots are inquisitive and love to chew things, they are not as destructive as other bigger cockatoos. They should always be provided with toys, blocks of wood or branches. 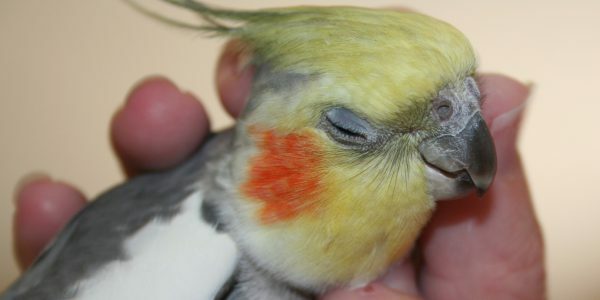 Young birds should be socialized to many people and exposed to a variety of situations, such as new cages, toys, visits to the veterinarian, handling by friends, wing and nail clips, etc. to avoid the fear of new situations. They also need space for exercise. Based on my experiences with my own bird I would say yes, this little parrot makes an excellent pet. Here are some of the pros and cons. Playful, mischievous and friendly, bare eyed cockatoos have a lot of personalities. They are a lot smaller than their cousins the cockatoo, and therefore less daunting to handle. They love to be played with and can be a little rough if they get too excited. They are easy to care for. All they need is some love and attention, and their fruit, veggies, nuts and seeds each day. They can live up to sixty years, so they make great lifetime companions. You can cuddle and pet them just as you would a dog in most cases. They are relatively cheap to keep, as the food doesn’t cost a lot. They are clever and you can teach them tricks and to talk. They are peace-loving birds like cockatiels and get on well with other bird types. Even though they are white, they manage to keep themselves fresh and clean and are never smelly. If they are, then you know they are sick. My bird prefers to bathe in her large water bowl, but most of them love a misty shower of water, which you can provide them with if it is not too cold. Don’t let your children play too rough with them, and they do nip if they feel threatened. They can be noisy. Mine was noisy for the first bit, but now only makes a noise if another bird comes too close, or in the morning if I take too long to bring out her food. They don’t talk as clearly as the African Grey Parrot and aren’t naturally talkative like some of the other parrot types. If you catch them in a bad mood they can give a nasty bite. Luckily this doesn’t happen too often. They are messy, like to pull their cages apart and chew everything in sight. Never leave unsupervised on your new couch. Because these birds are so active, you should buy the biggest cage that you can possibly fit into your space. The bigger the better. They should be fed a pelleted or extruded diet supplemented with fresh fruits and vegetables daily to add variety. Feed approximately 1/3 cup of formulated diet and 1/3 cup of fresh fruits and vegetables daily. Monitor the bird’s food intake as overfeeding leads to pickiness, selective feeding and wasteful food throwing. Bare-eyes are somewhat predisposed to obesity. Adult and juvenile bare-eyed cockatoos use calories efficiently and are picky eaters. Try to make sure that the food that they eat is nutritious and avoid feeding large quantities of high-fat seeds such as sunflower and safflower. Vitamin supplements are not needed for birds on a formulated diet. Birds on an all-seed diet need a vitamin/mineral supplement added to a soft food rather than in water, as water with vitamins and their accompanying sweeteners are a good growth medium for bacteria and can lead to bacterial disease. Vitamins and minerals which are added to seeds are often lost when the bird shells the seeds.